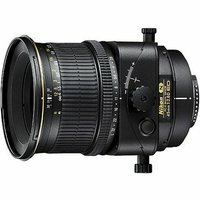 The Nikon PC-E Nikkor 45mm f/2.8D ED Lens is a standard-view lens with special "Perspective Control" tilt and shift functions, making it ideal for architectural and nature photography. Using tilt and shift correction will help obtain a natural-looking perspective in a distortion-free architectural image. The Nikon PC-E 45mm is compatible with all digital and 35mm film SLR cameras (in manual mode). With the latest digital cameras (i.e. D3, D700 & D300, and later models), auto-aperture control is possible directly from the camera itself. The ED glass element provides improved sharpness and colour, while Nikon's Nano Crystal Coat virtually eliminates internal reflections for greater image quality. Nikon Super Integrated Coating (SIC) offers outstanding colour performance and substantially reduced ghosting and flare.